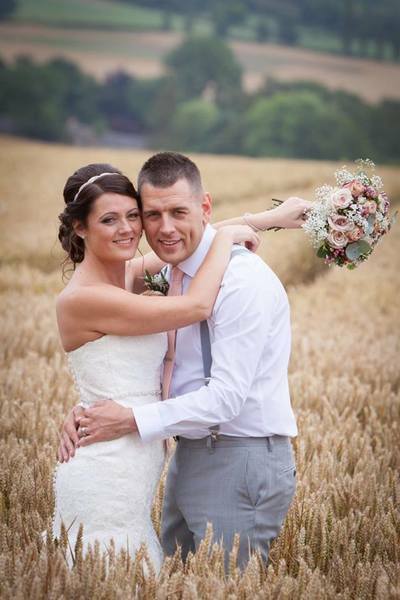 ​My name is Laura and I am a fully qualified, registered and insured bridal hair and makeup artist based in Leicester and covering weddings all over the East Midlands. ​I have over 20 years experience in the hairdressing industry and have been a makeup artist for 4 years. ​With over 200 weddings under my belt I bring a wealth of knowledge and expertise to help your day run as smoothly as possible. ​I was a finalist in the Hairdressers Journal British Bridal Hairdresser of the year as well as a regional finalist in the Wedding Industry awards. ​The parlour is a gorgeous eclectic room based at my home where I hold all of my trials, its comfy and relaxed and resident Sausage dog Dave helps to look after you all. ​I am an official stockist of All Things Lucy Bridal Hair Accessories which are available for you to view and buy in the parlour. ​Only the best products are used for my brides, I have an extensive makeup kit including brands such as Estee Lauder, Illamasqua, Urban Decay to mention just a few. ​My Hair kit is just as comprehensive with brands such as Kenra Professional, Tigi and Schwarzkopf. Please take a look at my work and if you feel that I am the stylist for you hit the contact button and lets make you a Victory Rolls Bride.